Wouldn’t it be nice if our stuff would just magically transport itself from our old home to our new one while eliminating all of our unwanted junk in the process? Until someone develops such a wonderful technology, we’re stuck packing and hauling our household possessions whenever we need to move. Whether you’re moving across town or much farther, something always seems to go awry. Here’s a short list of common moving mistakes you should avoid so your move can proceed more smoothly. If you prefer chaos and scalp depletion, go ahead and try to keep all the essential details of the move solely in your mind. If you’d like a more organized moving event, create a detailed checklist of all the important steps in your moving process and refer to it often. It’s easy to think you can just throw all your stuff in boxes in a few days and be ready to haul. It’s the classic underestimation that will have you scrambling off-plan at the last minute. Even a tiny apartment move requires at least a week or two of packing. Avoiding the next mistake is the reason why you need to start packing well in advance of the move. Labeling your boxes only by their room destinations hardly suffices when you need to find a sauce pan, egg timer and toaster in a hurry once you arrive at your new home. Rather, label the boxes by room and assign each a sequential number. Write these down in a notebook with a listing of the contents of each box. This way, you can refer to your list and go straight to the boxes containing your needed items. Otherwise, the first few days in your new location will feel like a never-ending scavenger hunt until you’re finally unpacked. On the top of your moving plan should be eliminating anything you don’t want to take or no longer need. 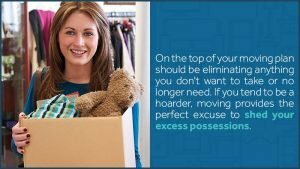 If you tend to be a hoarder, moving provides the perfect excuse to shed your excess possessions. See if you can’t donate some old clothes or hook your friends up with some appliances and knick-knacks you no longer need. We make no accusations, but things have been known to disappear without a trace during moves. Rather than pack on the truck, it’s best to keep those items with you that may tempt a thief. Also, your important documents should remain close to you if possible. Birth certificates, banking and insurance information, passports, etc., should travel in your car and not on the moving truck with your less important goods. What about the rest of your expensive stuff? Don’t cheap out on the insurance. Without it, you may not be reimbursed much if movers accidentally damage things, and maybe not at all if your items never make it into your new place. If you plan to hire a moving company, be sure to book well in advance of the moving date. Good, reputable movers book up fast as colleges finish up the school year and at the end of each month. The heaviest moving season happens during the warmer months. If you wait too long to choose your company, you could end up with one who isn’t booked up for very good reasons. While we wait for transporters as dreamed of in the Star Trek franchise, you can make your moving easier today with Zippy Shell of Greater Columbus technology. We bring a container of a suitable size to your home and park it in your driveway or on the street. You fill it at your leisure, and once you’re ready, we pick it up and deliver it to your new home. If needed, we can hold it in one of our secure storage facilities in a climate-controlled environment for as long as you want while you wait for your new place to become available. Then you unpack it on your own schedule. It’s that simple. Even better is our current special of $20 off your monthly storage! Contact us today to schedule a free quote.